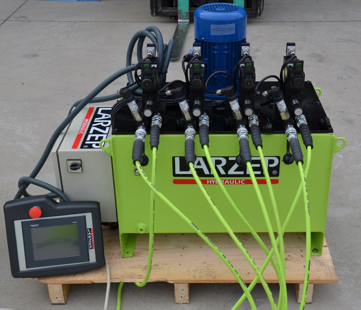 Larzep Australia’s synchronised lifting system provides the ability for one operator to remotely control the raising and lowering of multiple cylinders synchronously. The system is driven by the displacement of the jacks and is not influenced by uneven loading on the cylinders. Stroke of the cylinders up or down can be controlled to within 1 millimetre accuracy. The pressure transducers on the pump allows for load measurement on each cylinder to within ±0.25%. The system is totally controlled via a simple touch screen remote control. Once the main power supply switch is switched on, the screen is used to control all functions of the system, including motor start / stop. 4 x outlet D/A 100L reservoir hydraulic Pump 415V 3 phase with 4 x solenoid operated directional control valves. Flow rate 0.3 litres / minute each outlet. Pressure Transducers, linear transducers, lowering valves and Pressure Gauges. PLC controller and 10 inch touch screen for operator control, Electrical Cables to Cylinders, and external Linear Transducers. Available for rent or purchase today!